In response to the growing number of Catholics on Long Island, Pope Pius XII established the Diocese of Rockville Centre in April of 1957. The diocese covers 1,198-square-miles in Nassau and Suffolk Counties. The diocese serves approximately 1.5 million Catholics (total population in both counties is approximately 3.4 million). There are 133 parishes in 115 towns. In 2008, more than 17,000 baptisms, 19,000 confirmations, 17,000 first communions and 3,000 marriages took place in the diocese. There are approximately 20,000 students in Catholic elementary schools; 13,000 in secondary schools and 3,500 in higher institutions. There are 69 Catholic elementary and high schools and one Catholic college in the diocese. Catholic Health Services of Long Island consists of five hospitals, three nursing homes, and a community-based home for those with special needs and a hospice. In 2008, Catholic Charities assisted more than 55,000 individuals who are poor, vulnerable and disadvantaged on Long Island. Although the Seminary is part of the Diocese of Rockville Centre, its history begins with the Diocese of Brooklyn. On July 29, 1853, Pope Pius IX separated geographical Long Island from the guidance of Bishops of New York and established the whole of Long Island as the Diocese of Brooklyn. In this diocese (120 miles long, 20 miles its widest), the first Bishop, John Loughlin, found about 15,000 Catholics served by 23 priests and 22 churches. 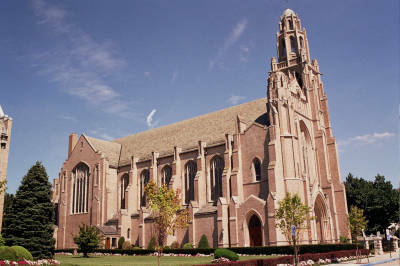 Over the following years, the clergy for the new dioceses were trained at American seminaries: St. Mary’s, Baltimore; Mount St. Mary’s, Emmitsburg, Maryland; and Our Lady of the Angels, Niagara, New York; and both American and foreign-born students were also prepared for the priesthood of Brooklyn in European seminaries: St. Patrick’s, Maynooth and All Hallows, Dublin (both in Ireland) and the North American, Capranica, and Lateran seminaries in Rome. The need for a diocesan seminary was filled in 1891 when St. John’s Seminary opened in Brooklyn under the direction of the Vincentian Fathers. However, as the Diocese grew, that seminary was unable to accommodate the large numbers of men seeking to serve as priests. Expansion of the building was not feasible, and eventually it was able to accommodate only about one-half of the candidates from the Diocese. In response to the need to establish a place to train the numbers of men seeking priesthood, the third Bishop of Brooklyn, Thomas E. Molloy, in 1924, purchased a tract of land of some 200 acres in the Village of Lloyd Harbor, Huntington, in Suffolk County. That same year, he selected a core faculty and sent them to Munich and Louvain for postgraduate studies in preparation for their role as seminary educators. In September, 1926, the Institute of Philosophy opened with twenty-five students in what had been the residence of the Conklin family on the Lloyd Harbor property. From 1926 to 1930, this institute provided a two-year course in philosophy for about one hundred students who, after their studies there, went on to theology at St. John’s in Brooklyn or one of the other foreign or domestic seminaries traditionally serving the Diocese. In the meantime, ground had been broken for the new seminary at Lloyd Harbor in May, 1928. This building was dedicated and formally opened on September 28, 1930. Its first student body numbered eight-five men enrolled in the two years of philosophy and the first year of theological study. A class of theology was added each year following until reaching the full complement of four years of theology students. With a majority of seminarians now studying at the new facility, St. John’s Seminary in Brooklyn was closed in August, 1932. However, it continued to be a diocesan policy to send a significant number of students to other American and foreign seminaries in addition to the new seminary in Huntington. In 1957, because of tremendous growth, Long Island was divided into two dioceses. The counties of Nassau and Suffolk were formed into the Diocese of Rockville Centre, leaving Kings and Queens counties as the Diocese of Brooklyn. The Seminary was now located within the boundaries of the newly-erected diocese. It continued to train men for both dioceses with the traditional six-year course until 1967, when the years of philosophy were phased out as a result of a restructuring of the Seminary program. Currently the Diocese of Brooklyn and Rockville Centre (numbering over three million Catholics served by some 350 parishes) send most of the theological students to Huntington. In addition, in 1990, the East Coast Province of the Congregation of the Mission, also known as the Vincentians, selected the Seminary as the theologate for their candidates for priesthood. In the fall semester of that year, the Vincentian seminarians and two Vincentian faculty members transferred to this Seminary. In 1974, for the first time, the Seminary admitted students who were not preparing for ordination. In response to the need for qualified religious educators throughout both dioceses, these men and women entered upon a program of courses in which they received a Master’s degree in Religious Education. In response to the growing number of students – men and women, religious and lay – who desired to pursue degrees at the Seminary, the diversity of their interests, and the ever-expanding opportunities for nonordained ministers in the Church, a Master of Arts in Theology program opened in 1982. The growing need for expertise in particular areas of ministry led to the development of a Master of Arts in Pastoral Studies program in 2004. In 2003, candidates for the Permanent Diaconate of the Diocese of Rockville Centre began earning credits toward the Master of Arts in Pastoral Studies degree. In 1985, in response to numerous requests from experienced ministers for advanced opportunities for ministerial reflection, the Seminary began the process of developing a Doctor of Ministry degree program. In 1987, the first Doctor of Ministry class was accepted by the Seminary and was composed of priests, religious, and lay students from the Dioceses of Rockville Centre and Brooklyn. The Seminary of the Immaculate Conception is no longer used for seminarian formation but continues be used for ongoing priestly formation post-ordination, diaconate formation and graduate studies.